After a series of family deaths, I sunk into a depressive state. I wasn’t suicidal, but I sought medical help. It wasn’t the depression that made me suicidal, it was the drugs. In fact, the drugs didn’t make me suicidal either: they made me homicidal. Even if my friends had run home to their parents, and told them that they’d played with a gun at my place, none of the parents ever confronted my parents about it. We had a gun. In the UK, that was unusual for sure, but it was what it was. Then my brother died of cancer, my father shortly after, and I became depressed. It wasn’t a deep depression, it manifested as extreme social anxiety and the desire not the leave the house. As someone who’d travelled far and wide around the world, there was no denying it was affecting my life. I’d booked a plane to Panama, and I broke down in tears when I realised there was no way, in that state, I was even going to get to my local airport. Then I didn’t stop crying. For almost 5 days straight. I went to our family GP who prescribed me Citalopram – a Selective Serotonin Re-Uptake Inhibitor (SSRI) that is proven to relieve many cases of social anxiety. I’d had one depressive episode before, when I was living in Chile, where I’d been prescribed it. 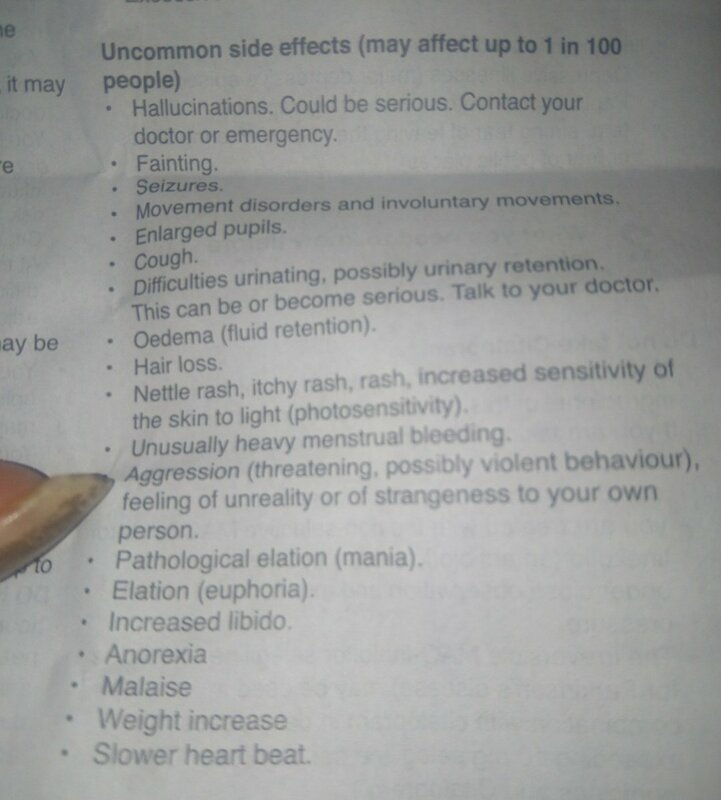 I never took it though, because I’d been too afraid of the side effects. I wasn’t suicidal, but the warning said it may lead to suicidal thoughts, so I avoided them. The first two weeks of taking Citalopram I felt sick as a pig. I phoned up my doctor to book an appointment and change my drug, but the line was busy for about an hour, and then I’d started to focus on something else, and the idea slipped my mind. Then, in week three, a miracle happened. I woke up one morning, and I was me again. The version of me that could talk to people, the version of me that could walk to the shops, the version of me that wasn’t crying all the time. This was a wonder drug as far as I was concerned. It was great. I went to Panama, I had a fantastic holiday, and I came back full of happiness. But that guy. That guy who’d let me down recently? Well, no, he didn’t deserve to live. It wasn’t a romantic thing, he’d just disrespected me. I didn’t like his wife much either. And his kids? They’d tell on me. They’d have to go too. I had a gun. I knew how to use it. When was the best time to sort that little problem out? Just a niggle at first. Then I started drawing maps. Writing plans. I have a notebook that wipes itself clear after three minutes in the microwave. It was safe. My little secret. But the second I put my hand on the gun – just to test it, just to feel it – I jolted back to reality. The timing was serendipitous. The West Midlands Police had a two-week firearms surrender in progress. Not trusting myself to drive, I walked to the station, carrying the gun, and I handed it in. “My Dad died recently,” I explained, and no further questions were asked. I sat at home for a further 5 days, and my mind would wander back to the idea of killing. Not the guy, not his family; just letting loose somewhere. I still wasn’t suicidal, I just didn’t care if I lived or if I died; whichever way the dice landed was okay by me. Then, as abruptly as they started, the homicidal thoughts stopped and I carried on taking the drugs. I stopped for a week at the start of the year, and I sunk back down within 3 days of stopping, so I started taking them again, and I still take them now. I am not a violent person. The two acts of violence I have committed in the past were both in self defence. I’m your typical loony leftie, and I can’t even kill ants. But whilst I strongly defend every American’s right to bear Arms – I think you’d be a whole lot safer if there was an exclusionary period for people adjusting to SSRIs. With 1 in 9 Americans reported to be on anti-depressants, and 1% of them reporting the side effect of aggression or violence, that means there are approximately 400K possible mass shooters out there. How many recent mass shooters have been on SSRIs? Only just about all of them. (*not thoroughly fact checked). Keep in mind, that 400K figure is only based on those who’ve self-reported. From my side, I haven’t seen my doctor through any of this, but I have to go back for a review next month. I’ll probably print this out and read it to him. For once, I am the 1%.